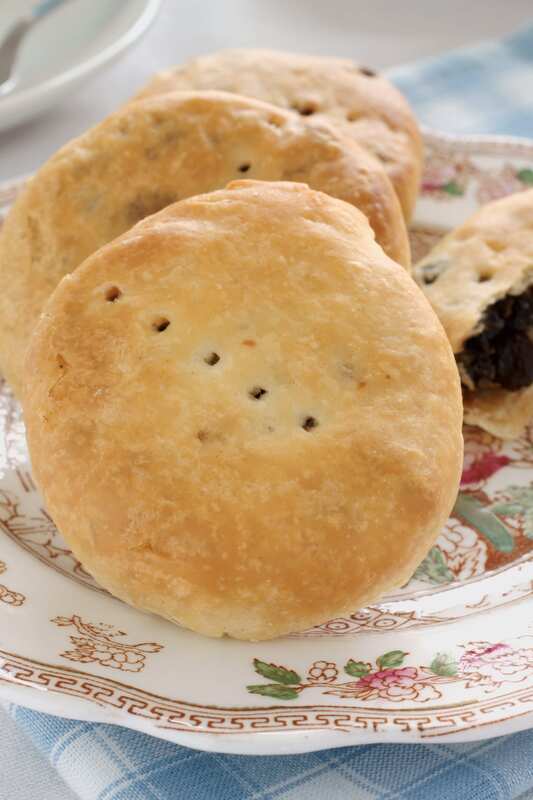 Before the rise of the cupcake, the delights of pop cakes or the glamour of Red Velvet cake; indeed even before the tearoom staple the Victoria Sponge came a delectable treat of currants sandwiched in rich pastry; known as the Eccles Cake. The Eccles cake can be a sumptuous treat with its juicy filling of butter, sugar and dried fruit enveloped in pastry, but unless you are local to a good bakery you need to resort to making your own as the commercially made ones that come in plastic wrappers are nothing more than a ‘dead fly’ abomination and not worthy of the name of great Lancashire delicacy. Eccles Cakes, Hawkeshead, Banbury, Chorley, Newburgh and Coventry Godcakes all belong to the same class of fruit filled pastry and whilst there is debate over whether puff pastry or flaky pastry is best I use a recipe that incorporates puff pastry and I find it to always yield good results. I use a recipe from Elizabeth Raffald [1733-81] and these are delicious warm out of the oven or served as part of an afternoon treat with a knob of butter. Melt the butter in a saucepan and add in the mixed fruit, mixed peel, currants, mixed spice, ginger , nutmeg and Demerara. Stir with a wooden spoon and cook for 4 minutes. Remove from the heat and set aside to cool. Roll out the puff pastry until it is very thin. Use a large, plain pastry cutter an cut the pastry into rounds. Place a good tbsp of the mixture onto each round. Gather up the edges, turn over and presswith a rolling pin into a flat cake. Then shape back into a round. Place the prepared cakes onto a dampened baking tray. Brush the cakes with a little beaten egg white and sprinkle with caster sugar. Lower the oven temperature to 200 °C/ 400 °F / Gas Mark 6 and bake for 18-20 minutes in the centre of the oven until golden brown.